Today’s news that Doctor Who attractions may be on the way to a new British theme park afforded a perfect opportunity to share a story that nearly brought that popular franchise to Disney’s parks. 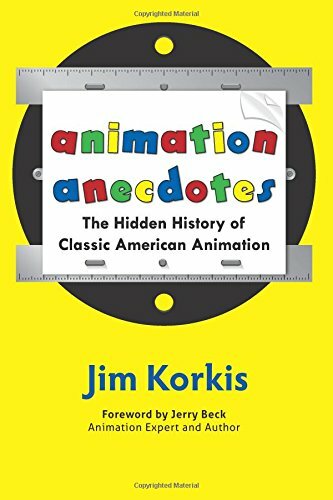 At D23’s recent Destination D: Attraction Rewind event at Walt Disney World, I ran into Disney historian Jim Korkis who shared an interesting tale of a Disney attraction that almost was. As we eagerly await the trailer release for “Star Wars: The Force Awakens” this week from Disney and Lucasfilm, it’s hard to imagine a day when the two companies weren’t in partnership. But before that deal was signed in the 1980s, another major franchise was being considered. 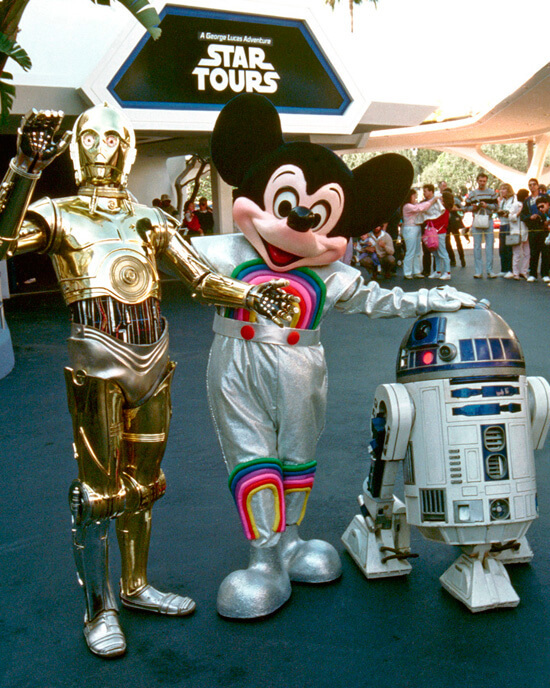 Ultimately, of course, we know that Star Tours opened at Disneyland in 1987 with a grand character-filled ceremony, a result of that Lucas deal. But can you imagine seeing Mickey dressed as the Fourth Doctor instead of an astronaut? 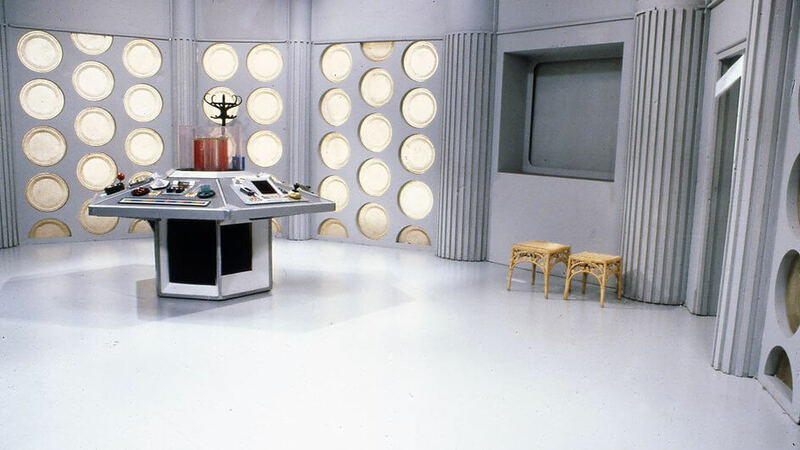 “One of the things Imagineers designed was a TARDIS, where you would enter the TARDIS and of course as you exited on the other side you were into a warehouse building – because we all know the interior of the TARDIS is so much larger,” added Korkis. From there, guests could have boarded a Doctor Who themed dark ride, according to Korkis, that would take them on adventure through through time and space. “Eisner also intended to make a Doctor Who movie and at the opening of the attraction he was going to announce who was going to be playing Doctor Who in that,” noted Korkis. It wouldn’t have been the first time there was a Disney twist to the Doctor. In a Christmas edition of “Disney Time,” a BBC TV series, Tom Baker (the Fourth Doctor) appeared amidst animated Disney clips and even disappeared in the TARDIS at the end, as seen in the YouTube videos below. Much earlier than that, in Disneyland’s early years, Korkis says a Doctor Who script called for a trip to the newly opened park, but the BBC didn’t want to foot the bill to travel across the pond, so instead Disneyland was merely referenced in the planned episode. Ultimately, of course, a longtime partnership was formed with George Lucas and the Doctor Who franchise slipped away from Disney’s grip. Years later, it would be revived and continues to thrive today, leaving its fans wondering if any theme park will pick up the popular property. I seem to recall a number of U.S. studios expressing interest in rights to Doctor Who over the years, and I’m sure Disney was among them. But Korkis’ timeline appears to be a bit off. Star Tours soft-opened in December 1986, but Korkis says Disney considering purchasing the Doctor Who franchise “before George Lucas and Star Wars” since “the Doctor Who franchise hadn’t been active.” But that’s incorrect. The first run of Doctor Who on BBC was from 1963-1989 so the franchise was most definitely active during the planning and opening of Star Tours. Was it under constant threat of cancellation from the BBC at that point? Indeed it was. But the BBC didn’t pull the plug until just about three years after Star Tours’ soft-opening. Mainstream US studios were curious about Classic Who when it was on the PBS stations–since it was a cult item they “didn’t own”–but Fox’s attempt to re-jumpstart the ’89 cancellation with the Paul McGrath movie pretty much ended those hopes. That’s probably why the Ninth Doctor wasn’t interested in taking Rose there. I’m sure that’s a paraphrase of Korkis, and one that’s incorrect. 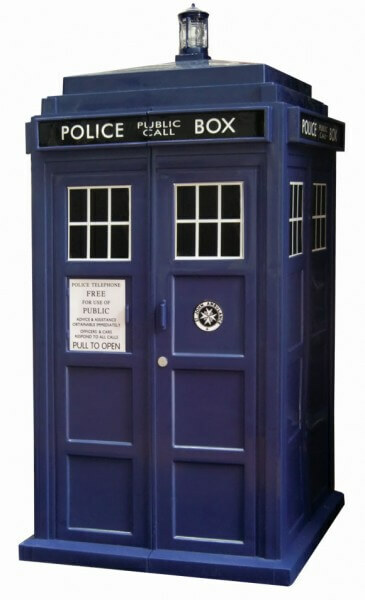 Doctor Who premiered in 1963 (as Whovians know) and even if you kick around the idea that it may have been during the pre-production buildup for the first season, that was only a year or two at most…well after Disneyland was established and moving solidly into it’s place as an american icon and long standing operation. hardly a “newly opened park). Additionally, I doubt they would have thought to do that for the first episode, but rather later seasons, as they were completely taken aback by the success of Doctor Who, and originally intended for it to be a educational program, not the science fiction adventure it later evolved into. I’d suspect, if it did happen to a “new” park, Korkis was referring to WDW / Magic Kingdom, not Disneyland. And, that would make sense. In 1972-73 it would have been Pertwee Era, which the show was dramatically underfunded at the time (hence why they wrote the “banished to earth” storyline which had him spending most of his time, especially the early seasons, toodling around in an antique car around the English countryside…budget budget budget. I’d still love to see it make it’s way to the UK pavilion! Unless by ‘newly opened park’ they meant that the story was based around a visit to the park in 1955 rather than it actually being filmed then? Although it still calls into question the fact that it was in Disneylands’ ‘early years’. The thought of a Doctor Who story set in Disneyland sounds far more JNT-era, so could be any time from 1979-1989. When it come to the world of theme parks, Disney is much bit like Universal Studios by producing attractions and rides based on outside properties for thier theme parks like for expemple: they have bought the rights of Avatar, for Fox by creating the upcoming Avatar-themed land for Walt Disney World, a current attraction like Tower of Terror ride based on the show Twilight Zone, a closed attraction based on Fox’s American Idol series, properties before later on bought by Disney like Lucasfilm (e.g. Star Wars and Indiana Jones) and The Muppets (previously owned by The Jim Henson Company), and as well as attractions based on Non-Disney franchises that never came to be like the ones based on BBC’s Doctor Who franchise. I appreciate the publicity but yes, there was some slight misunderstandings between my comments and what appeared in print. During the end of Pertwee’s run, and the beginning of Baker’s run, the series was getting a lot of attention in the United States. So, there was a proposal for one of the serials to take place at Disneyland where the Doctor would be tracking down an alien. The premise, of course, was that Disneyland is a pretty alien place of its own, so it would be the perfect place for an alien to hide. Unfortunately, the limited budget for the show killed the idea. In 1987, The Seventh Doctor (Sylvester McCoy) appeared in a three-episode serial entitled “Delta and the Bannerman.” The premise was the Doctor and his companion, Mel, and a bunch of aliens were to spend a week at 1959 Disneyland (when the first three E Ticket rides opened). However, when their Nostalgia Tours bus hits an orbiting satellite, they all then end up at a holiday camp in South Wales which was more appropriate for the BBC budget. In the late 1980s and early 1990s, the Disney Company was actively looking for franchises to purchase, like the Muppets. Disney made several attempts to buy the rights to Doctor Who and its video library. At one point, it looked like a deal would finally be made when the show went into an indefinitely long hiatus in 1989. Preliminary plans were drawn up for a walk through attraction at Disneyland’s Tomorrowland that would have taken guests through the inside of the TARDIS. There were also preliminary plans for a dark ride through time and space. Star Tours originally debuted at Disneyland in 1987, and there has been some speculation that Disney’s attempt to purchase the Doctor Who franchise may have been an effort to have a “Plan B” in case the partnership with George Lucas ran into challenges. In the third novel about The Ninth Doctor (Christopher Eccleston), the companion Rose Tyler says she would like to go to Disneyland and the Doctor responds that he can take her to a place with real talking mice. 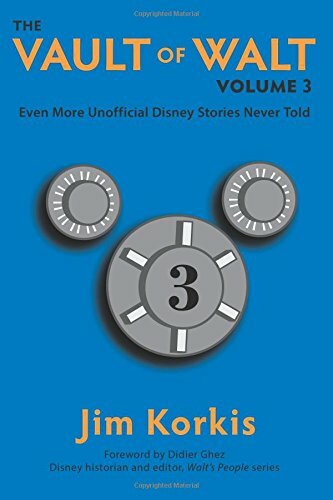 There is more to the story and since people are interested maybe I will include a chapter in my next VAULT OF WALT volume. The idea to film at Walt Disney World actually first came in 1981, a few years later than the Pertwee/Baker changeover, which happened in 1978 in the US.